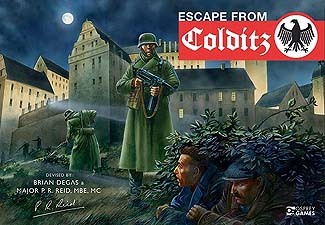 Designed by Major Pat Reid, one of only a handful of prisoners-of-war to escape Colditz Castle, and screenwriter Brian Degas, Escape from Colditz is the ionic game of careful planning and nerves of steel. Become Allied escape officers - assemble your equipment, plot your scape routes, and coordinate your efforts to avoid the guards. Become the German security officer - maintain control through guile, ruthlessness, and careful observation despite limited numbers. This deluxe edition of the classic game for 2 to 6 players includes both original and updated rules, new hand-painted artwork, an oversized board, 56 wooden playing pieces, 100 fully illustrated cards, a 32-page history book, and unique replicas of artifacts from the prison. Seventy-five years ago, Major Reid braved barbed wire, searchlights, and armed guards to Escape from Colditz. A delightful updating of the original board game. This not a remake in the true sense that there have been significant changes to the rules, but more a renovation in physical terms while trying to maintain all that the very first edition encapsulated. A more colourful map with enhanced use of colour and an almost 3D effect to the walls of the castle and its many rooms. Even more inclusion of copies of historical documents and a substantial history booklet considerably longer than the rules with coloured illustrations of scenes and two evocative black and white reproductions of photos of the castle add to the atmosphere. There are a few fairly minor rule changes, but all in the same liberal style of the original. So, instead of suggesting an approximate playing time, they suggest a number of game turns for inexperienced players and then a shorter number of game turns for more experienced players. But all is flexible - really it's up to you how many turns you play. The game box and insert is much sturdier and the crads slightly more colourful, but in essence this is an excellent homage to the original and great opportunity to introduce this classic to a whole new generation.